A group sat with photos of Rahul Gandhi, his mother and former Congress chief Sonia Gandhi, his sister Priyanka Vadra, Madhya Pradesh leader Kamal Nath and Rajasthan leader Sachin Pilot. 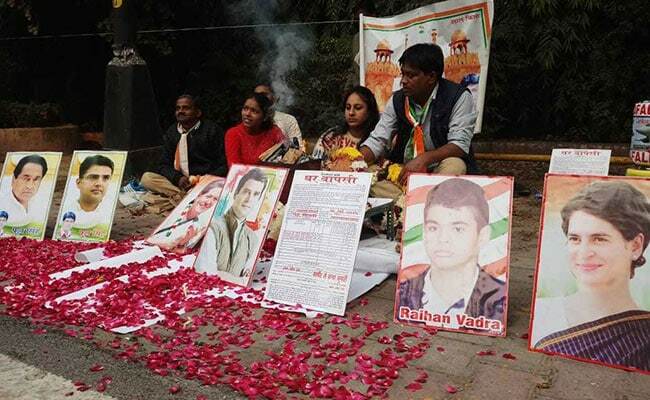 Congress workers performed a "havan" or ritual outside party president Rahul Gandhi's home in Delhi as votes were counted for elections in five states. The Congress was ahead in Rajasthan but it was a very close fight in Madhya Pradesh and Chhattisgarh in the first hour of counting. At the "havan", a poster soon came up congratulating Rahul Gandhi. A victory for the Congress will be a big boost for Rahul Gandhi, who is yet to count many big wins since he took on a greater leadership role in the party.